In the market for a new midsize sedan? As the most popular type of car on the road, midsize sedans have a huge selection of makes and models. While it is always better to have choices, having too many options can make a search for a new car difficult. 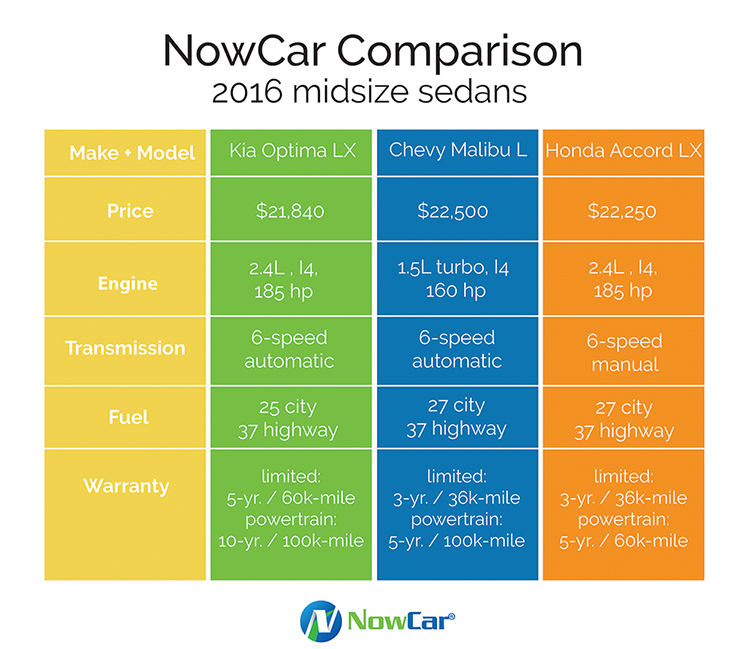 To help buyers on the market for a sedan, we have compared the 2016 models of the Chevy Malibu L, Honda Accord LX and Kia Optima LX, three of America’s most affordable and best equipped sedans. In its fourth generation, the Optima is a little longer, a little taller, and a little wider than the former iteration and has a sleek body style that will turn heads. The standard 2.4 liter, four-cylinder power plant produces 192 horsepower and 181-pound feet of torque. Connected to the front wheels via a shiftable 6-speed automatic transmission the Optima delivers an estimated 25 MPG city and 37 MPG highway. The 2016 Optima’s ratings by the Insurance Institute of Highway Safety (IIHS) have not been revealed, but the 2015 safety ratings were “good” for side and front crash tests. As the base model in the Optima line, the LX delivers standard features not often found at $21,840, like leather upholstery, a sunroof and parking camera. The Optima has full power accessories, windows door locks, cruise control and includes a 6-way power driver’s seat. Kia also offers one of the best warranties in the auto industry. All Kias are backed by a 5-year/ or 60,000-mile basic warranty, 10-year or 100,000-mile powertrain warranty, and come with 10 years or 100,000 miles of roadside assistance. With a full redesign for 2016, the Chevy Malibu L has striking new lines and a quiet cabin. Powered by a six-speed automatic transmission and a turbocharged 1.5-liter 4-cylinder engine, the Malibu is capable of turning out 160 horsepower. Malibu drivers can expect 27 MPG city and 37 MPG highway. The 2016 Malibu was an IIHS “Top Safety Pick” and received a “superior” rating for front crash protection. Standard equipment on the Malibu L includes cruise control, keyless entry and ignition, cloth upholstery 60/40 split rear seats, and Bluetooth connectivity for electronics. The Malibu L has a starting MSRP of $22,500. Chevrolets come with a 3-year or 36,000-mile basic warranty and a 5-year or 100,000-mile powertrain warranty. The Honda Accord LX is powered by a 2.4-liter, 4-cylinder, 185-horsepower engine. It has an estimated fuel economy of 27 MPG city and 37 MPG highway, which is identical to the Malibu. The standard Accord LX comes with a 6-speed manual transmission, the only manual offered in this comparison of mid-size sedans. Hondas are covered with a 3-year or 36,000mile basic warranty and 5-year or 60,000-mile powertrain warranty.